Twenty years has taken Moskito Diving a long way around the Phi Phi Islands. Moskito Diving was the first that dared to go diving in and around Phi Phi - when it was considered dangerous and a nearly impossible feat. From a tiny shack started by an old Austrain, who built his own little shop in 1987, Moskito Diving has gained years of experience in exploring local Phi Phi Island sites, and is now a huge PADI 5 Star IDC Center. Moskito Diving in Tonsai Bay, Phi Phi Don caters to novice as well as experienced divers. They offer an indoor training pool, along with four fully equipped classrooms. If equipment is a problem, Moskito Diving has scuba units available to rent and a repair shop with qualified technicians. Excursions leave the shores of the Phi Phi Islands on one of three Moskito dive boats that range from an 85-foot live-aboard to a 48-foot custom day trip boat - and the powerful Zodiac that offers day trips at the high slack tide. Moskito's 5.2m Zodiac departs several times a day, and divers pick the time of departure and their favorite dive sites. Live-aboard diving is a relaxing way to dive several times a day on a spacious, well-equipped boat. Moskito Diving offers high-end hotel-like accommodations on their live-aboard boats, as well as great diving right off the deck. One very popular site is the "King Cruiser" wreck dive. This wreck is a 285 foot ferry that sank in 1997, after hitting the top of the Anemone reef on the way to Phi Phi. Fortunately, all passengers were safely brought ashore; however, the ship remains upright in 32 meters of water and has created a large artificial reef that is absolutely spectacular. 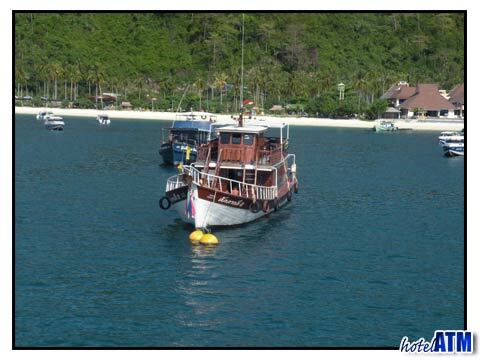 If you are diving in and around the Phi Phi Islands with Moskito Diving, you can't go wrong. Outstanding reefs and magnificent scenery in the Andaman Sea surround the Islands. Tourists who travel to this "paradise on earth" are enchanted by the wonders of nature that they encounter and by the charismatic charm that the Phi Phi Islands offer. The Phi Phi Islands are a group of six islands; however, only Phi Phi Don is inhabited. If diving or snorkeling Moskito style is not on your agenda, there are certainly plenty of other activities to partake in on Phi Phi Island. For a relaxing day, many choose to sunbath on the powdery silk sand of the crystal clear water beaches. For the adventurous, big game fishing is a "must try," as is rock climbing on the limestone cliffs of Phi Phi. The cliffs are a challenge; so "bold and brave" should be an attribute of those who dare.